Curvature arising from endogenous forces. Functioning independently of the will; not under voluntary control: a reference to that part of the nervous system that regulates the activities of blood vessels, secretory glands, and viscera. It comprises parasympathetic and sympathetic components. Relating to or important in the control of the autonomic nervous system. 1. Not controlled by others or by outside forces; independent: "an autonomous judiciary; an autonomous division of a corporate conglomerate". 2. Independent in mind or judgment; self-directed. 3. Independent of the laws of another state or government; self-governing. 4. Of or relating to a self-governing entity: an autonomous legislature. 5. 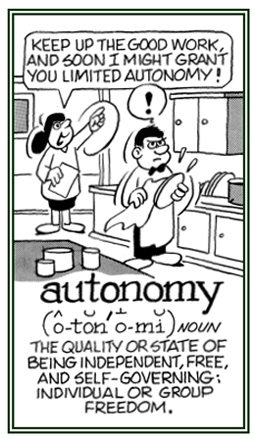 Self-governing with respect to local or internal affairs: an autonomous region of a country. 6. In biology, independent and self-governing to the extent that the organism is able to act on the basis of endogenous forces and not only in response to external influences. 1. The state of existing or acting separately from others with the power or right of self-governing: A certain country was granted autonomy after the war and so it became an independent nation. After World War II, many of the British colonies were granted autonomy. 2. The quality or state of being independent, free, and self-directing: After her divorce, Lina wanted autonomy from any further restrictions in her life. © ALL rights are reserved. 1. Literally, one’s own name as opposed to a false name: A book or published work with the author’s real name. 2. The name given to itself by a tribe, social group, or people, as distinguished from a name given by foreign tribes or by anyone else. 3. A word that describes itself; such as, "pronoun is a pronoun", "polysyllabic is polysyllabic", "abbrv. is an abbreviation", "word is a word", etc. The use of a person's own name instead of a replacement name when writing, publishing a book, etc. The use of one's own name as an author, actor, entertainer, etc. instead of a special composed name. Showing page 15 out of 24 pages of 354 main-word entries or main-word-entry groups.